A few weeks ago, I managed to convince myself that it would be greatly beneficial for me to get a Smart Car for making short trips and running errands. After a bit of research I found out that Boston had a Smart car dealership, so I paid the “Smarties” a visit. 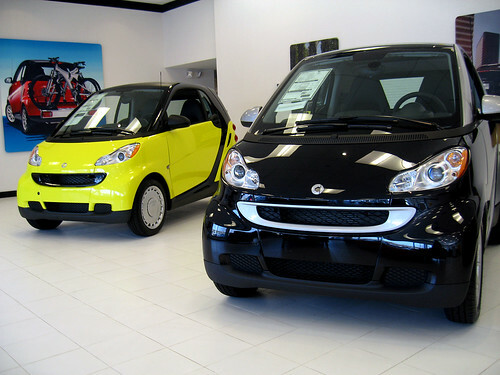 It became painfully obvious that I’d never seen a Smart car in-person because as soon as I saw the car parked outside of the showroom, I began hysterically laughing. All current and future Smart car owners, please stop misleading the public into thinking that the Smart car is actually a car–it is more like a 4-wheel Vespa with a roof. After looking at the three happy-looking cars on the showroom floor, I decided that I would spring for the top-of-the-line Smart “Passion” coupe with the optional in-dash GPS. I summoned a salesman and asked to take the toy out for a drive around the town. After getting some information from me we were on our way. I pulled out of the dealership’s parking lot and floored the accelerator, hoping to produce a roaring engine sound to scare the Mercedes drivers who were on the side of me, but instead I heard the car emit a noise that was akin to what I’d imagine a dying worm to sound like. I was disappointed already, but the test drive wasn’t over. At 20 mph I felt like the back bicycle-esque wheel would fall off, leaving me to toss the car into my back pocket and walk back to the dealership. I felt unsafe and I needed to get out of the death trap. When the test drive was over, I basically told the salesman that if I purchased the car my mother would disown me, my father would ban me from ever admitting that we were related, my friends would suddenly stop answering my calls and all I’d be left with is the fun-sized “smart car.” Unfortunately all of these things are not worth the sacrifice to gain a car that is smaller than my cell phone’s battery.